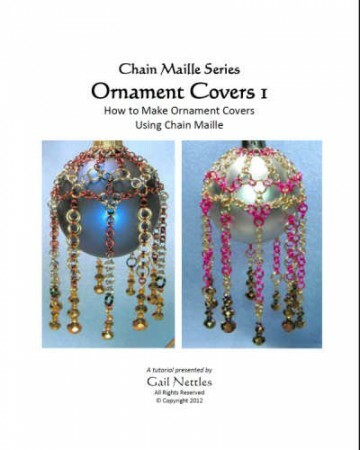 I have another chain maille Christmas ornament cover ebook tutorial to add to the list. 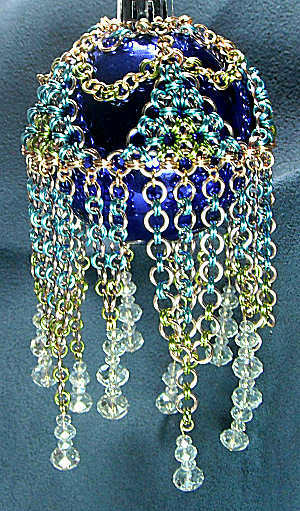 This one is quite different from my last one; it’s heavier, more intricate and simply gorgeous when done! This tutorial shows an ornament made with a Japanese style of chaining. If you’re not familiar with this technique, it’s joining jump rings in horizontal and vertical patterns. The main pattern is the Japanese 12 in 2, with some connections using fewer rings. If you’ve got as couple pair of flat nose pliers and a round nose plier, that’s all the tools you’ll need. Well, aside from the jumps rings and ornament! 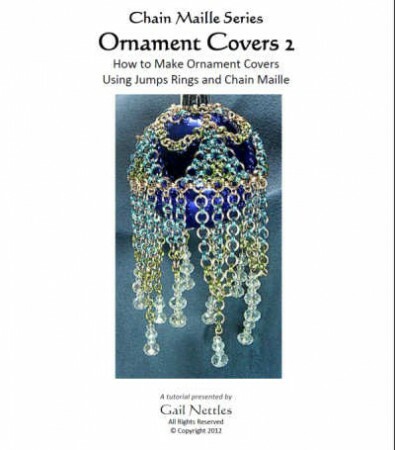 Here’s what you will learn in this tutorial for making Christmas ornament covers. The pattern and instructions for linking the rings to form the ornament cover. 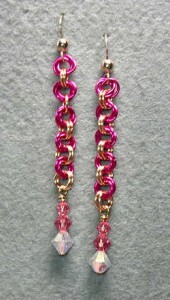 How to make beaded dangles. Tips if you’re using a larger ornament, to make sure it fits properly (very important)! It’s really a lot of fun, and it’s something that you will treasure for years and years to come. The ebook tutorial contains 19 pages of instructions, with 38 full-color photos with close-ups. At that point (through the magic of the internet), you’ll be whisked to your checkout of $6 for this ebook tutorial. Then you’ll get download instructions for the tutorial. Keep in mind that this isn’t a paper copy that gets delivered by snail-mail, but a PDF file that you get your hands on(so to speak) instantly. 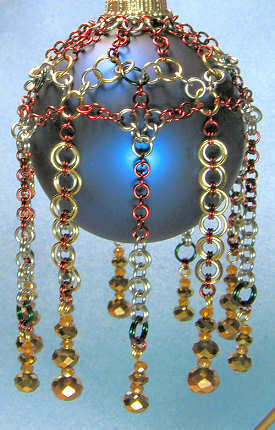 Go ahead and order, then get ready to make your own chain maille Christmas ornaments. They will be sure t bring ooooooohs and ahhhhhhhs from everyone who sees them! 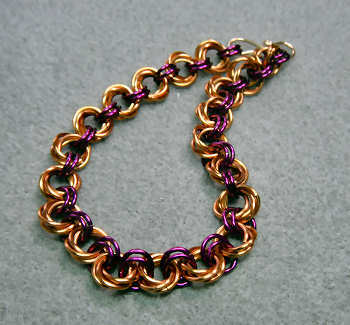 This flower chain video tutorial shows you how easy chain maille can be. 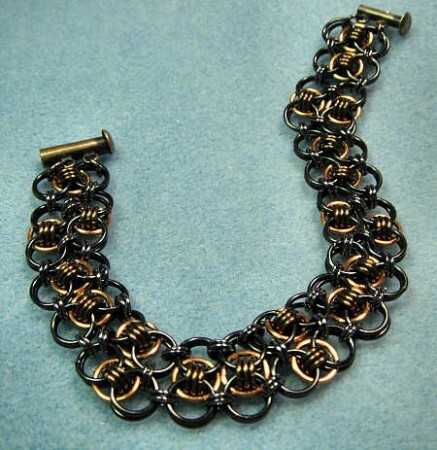 It’s something that is a little different from simply chaining jump rings together. Instead, the rings form little rosettes, which in turns gives the flower chain its name. You don’t need a lot of different rings (unless of course you want to get more intricate). The demonstration you’ll see shows two different colors and sizes of jump rings, but you can do it all in one size and color if you like. The flower chain is very versatile! You’ll need jump rings in 6mm inside diameter 18 gauge, and 5mm inside diameter 18 gauge rings for the bracelet. You will also need a clasp of some sort; I have used an “S” clasp, but you can use whatever you wish. There is also a set of earrings that you can make with this same weave; I show the photo and supplies after the video tutorial. The earrings are made with the same basic flower chain pattern. Seeing as I prefer earrings to be as light as possible, I have made them with 20 gauge rings instead of 18 gauge. I have also only used three rings instead of four rings for each flower rosette. Also, the AR of the rings I selected is only about 4.5, which is another reason I decided to use fewer rings in each flower. But, if you like, you can certainly use four rings per flower. 1 pair of earring findings; I used gold-filled. Here’s a tutorial for chain maille ornament covers. It’s a little different than your standard beaded ornament cover, and something you definitely don’t see every day! Jump rings rule the day, although there are also beaded dangles for a little extra “bling”. They are perfect for your own tree or ornament stand, or a wonderfully unique gift to give to others. While you may need quite a few jump rings for these covers, you don’t need a whole lot of sizes/gauges. If you don’t have the sizes and colors listed, with a little experimentation you can use the directions as a guideline for what you do have on hand. If you’ve got as couple pair of flat nose pliers, a round nose plier and a pair of wire cutters, you have everything you need as far as tools. The pattern and instructions for linking the rings to form a netting (easier than you probably think). How to create the two different types of straight chains. Instructions for simple loops and wrapped loops. Ideas for making your own variations!